I read this article and found it very interesting, thought it might be something for you. The article is called Modi’s Big Make-in-India Problem: Fewer Factory Jobs and is located at https://archive.indiaspend.com/cover-story/modis-big-make-in-india-problem-fewer-factory-jobs-79711. As Prime Minister Narendra Modi pushes his Make-in-India manufacturing plan and factory output rebounds, new data indicate two disquieting trends. One, there is a slowdown in employment in the formal, organised sector (which in any case employs only 12% of India’s labour force), the prime staging ground of Modi’s programme. Data released by the Ministry of Statistics and Programme Implementation on Indian factories show that more than 400,000 people lost their jobs during the financial year 2012-13. While India had 222,120 operational industrial units during 2012-13, according to the Annual Survey of Industries (ASI), an increase of 2% per cent from 217,554 units in 2011-2012; people engaged in factories declined from 13.43 million to 12.95 million – a drop of 3.6% (480,000). This cannot be a welcome development, given the focus on employment of Modi’s Make-In-India programme, under which the Prime Minister wants manufacturing to account for at least 25% of GDP from the current level of 16% of GDP. While the number of industries has increased 73% during the decade (2002-03 to 2012-13), total persons engaged in industrial activities has gone up by only 63%. But taken from 1994-95, the growth of jobs in proportion to capital employed and value of output shows a much stronger downward trend. The number of industries increased 80%. Total employment increased only 40%. Indeed, more people were employed in Indian factories during 1994-95 than a decade later in 2005-06. 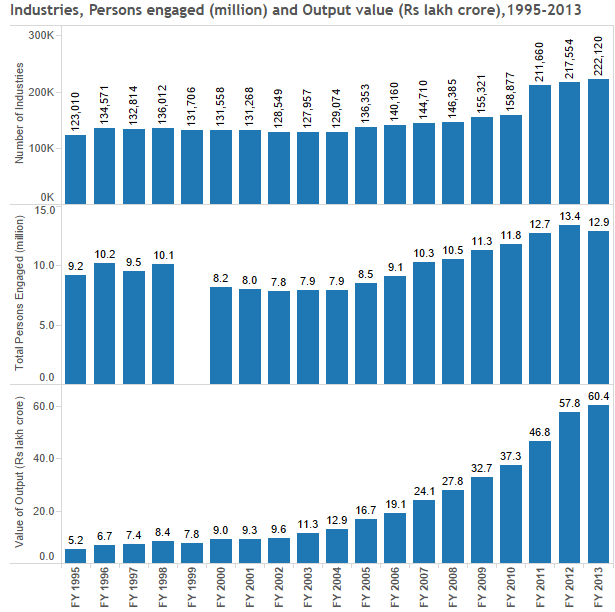 Clearly, industrial India is getting more output per person engaged in its industrial activities. In other words, it needs fewer workers to do the same work. Capital employed has been going up simultaneously across industries, which implies more automation and efficiency, thus reducing the need for workers. Capital employed across 123,010 industries was Rs 3,87,534.59 crore in 1994-1995, which has increased to Rs 31,39,028.07 crore across 222,120 industries during 2012-13. “The unorganised sector, in particular the household sector, accounts for a disproportionately large share of employment but a very small share of value added in manufacturing,” a working paper released recently by Indian Council For Research On International Economic Relations (ICRIER) has said. Employment estimates indicate that between 1999-2000 and 2011-12, Indian manufacturing (organised and otherwise) added 1.4 million jobs each year, against the 12 million now needed. The sector now employs more than 60 million people. The organised manufacturing sector for the same period increased jobs by 4.5%, employing 12.2 million in 2011-12, according to ASI’s results, which record formal employment. “While this was certainly not a period of jobless growth in the organised manufacturing sector, the rate of job creation falls severely short of the requirements of productive jobs for the 7-8 million youth expected to enter the job market each year in the next ten years,” the ICRIER paper said. The study goes on to mention that much of the action for improving the business environment needs to be taken at the state level. “We find that states with more inflexible labour regulations have witnessed slower growth in employment in manufacturing than states with more flexible labour market regulations,” the study said. However, the “dismal performance” of the manufacturing sector on labour regulations, the study noted, could not be blamed on labour regulations because these laws affect only permanent workers and companies, which are bypassing them by hiring contract workers. 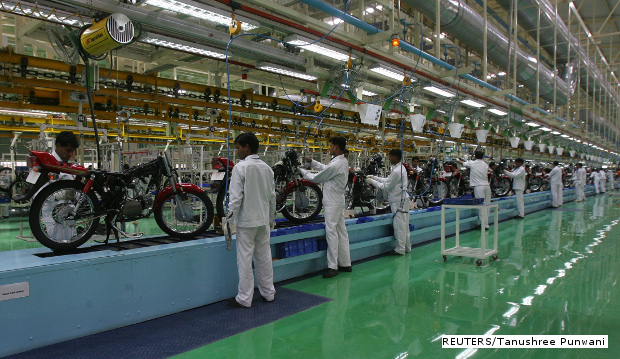 Globally, India is the 3rd largest employer in manufacturing, after China and the United States, according to this report by United Nations Industrial Development Organisation (UNIDO). That’s an improvement from the 8th position in 1970 and 5th in 1990. Source: UNIDO; Russian Federation had 30,352,000 manufacturing jobs in 1991 and was second between China and United States with a share of 11%. The number of jobs has declined since. Clearly, while employment is stagnant across industries–a cause of concern for those joining the labour force and the job-creation hopes of the Make-in-India programme–Indian industry is doing reasonably well, thanks to capital-intensive production methods and by moving labour from full-time employment to contracts. This is the dilemma the government will need to address. As yet, it has revealed no such plans. What does the phrase “number of industries” mean ? Number of units where manufacturing takes place? Includes large, medium, small scale and micro ?? Definition used by the ministry: Factory using power with 10 or more workers involved in manufacturing process or involving 20 or more workers without the aid of power.